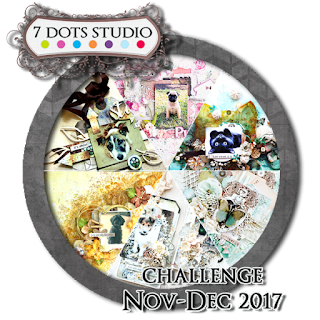 The New Collections from 7 Dots Studio landed in my craft room this week and man - DeeDee & Tusia did a amazing job - again! Since I´m no longer a part of the Design Team I have the chance to play along with the challenges! I created this layout using papers & embellishments from Paint Chips. I have always dreamed of a dog, but time is not there for our family. We know better than buying a dog we can´t focus 100% on. BUT if we would ever get one it would be a Nova Scotia Duck Tolling Retriever. The little raven like dog has all things I like - fun, curious, soft and of a perfect size. Well, the picture speaks for itself. I hope you like my layout! I would love if you left me a comment telling me what you think. such great page!!!! and truly a beautiful mind! Thank you for joining us at 7 Dots Studio.